G20 in Hamburg: Who are the protesters? 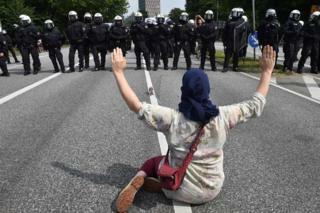 The pictures of protesters clashing with police in Hamburg made front pages around the world. But what are they protesting about? According to Fox News' Eric Bolling, the protesters "are angry that America isn't footing the bill for every social justice issue the world can come up with". Speaking to experts and the protesters themselves, it is clear that is not true. In fact, protesters like these are at most G20 summits, not least during London in 2009 and Toronto in 2010 - both during Barack Obama's presidency. While the new US president's attitude towards climate change may have angered some gathered in Hamburg, Donald Trump is certainly not the only leader to have invoked protesters' ire. Russian President Vladimir Putin's intervention in Syria, Recep Tayyip Erdogan's crackdown on dissidents in Turkey and the corruption allegations surrounding Brazil's Michel Temer were just some of the issues brought up by one protester. However, the big problem appears to be the very idea that 19 world leaders, plus the two top officials of the European Union, doing deals behind closed doors. "We know that the people who cause the misery that we have all over the world today - refugees, wars, and so on - they are sitting right now in the G20 and are having a chat," Suse Haber, a protester with an environmental group from Germany, told Reuters. "In New York right now, some 130 countries are preparing a nuclear arms treaty, in order to abolish nuclear weapons. Meanwhile, the leader of the nuclear powers are sitting here having a good time. That's what we're protesting." Researcher Julia Kulik, of the University of Toronto's Munk School of Global Affairs, agrees that, for a large number of the protesters, the idea of the G20 in itself is enough to send people onto the streets. "Seeing 20-21 people making decisions that affect the entire world is not appealing to a lot of people," she told Canada's Global News. If the pictures adorning news websites around the world are to be believed, those who descended on the city were masked and largely armed. But it is far from the truth: there are about 100,000 protesters in Hamburg for the G20, and all but a very a few are peaceful. Only 8,000 of those who descended on the city ahead of the summit were deemed a violence risk - and far fewer still were caught up in the clashes which erupted on Thursday night following the Welcome to Hell march. In fact, there is a range of events going on - including an alternative summit which was arranged by a group of NGOs, political parties and others ahead of the two-day G20. Those outside this tiny group were unimpressed with the more extreme fringes of the protest - but were also critical of the police. German protester Christian Luetzeler told Reuters those turning to violence were "really shooting themselves into the foot". "But at the end of the day, the people have in fact been provoked," he added. "The provocations still continue: not one politician from the government of Hamburg has come onto the street to de-escalate the situation. On the contrary, it is always pushed further." So who are the anarchists? Far-left extremism has become a feature of protests in recent years, and Hamburg - known for its squatter scene, which developed in the 1980s - is not stranger to violent protests. Clashes broke out at this year's May Day protest in the city, while in 2008 cars burned as extremists battled police on the streets for several hours. It meant Hamburg police were already aware of the potential issues ahead of the G20, drafting in police from around the country. They also carried out operations ahead of the summit, finding weapons they believe protesters would have used against officers. But the city was not just on alert for extremists within its bounds. 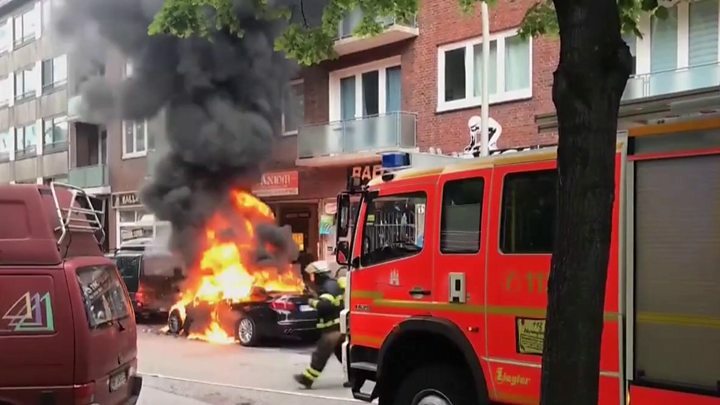 Police were expecting them to be joined by left-wing extremists from other German cities, including Berlin and Rostock, with others coming from further afield. In particular, Hamburg's police chief, Ralf Martin Meyer, was expecting anarchists to travel to Hamburg from Scandinavia, Switzerland and Italy. Is Europe lurching to the far right?